The folks at Imaging Resource have interviewed Kazuto Yamaki, executive president of Sigma. And the truth is that he’s dropped a few interesting pearls that let us intuit where the company–one of the main manufacturers of multiplatform lenses on the market–is going. 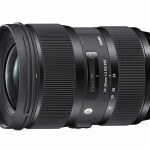 Though Yamaki affirms that he can’t foresee information about the products Sigma will launch in the future, he acknowledges that many users have asked him to work on a camera similar to its de Quattro but equipped with a Foveon full-frame sensor. And, in the face of all this demand, he’s said that Sigma’s seriously considering this idea. According to Yamaki, applying the architecture of the Foveon sensors that, as you all know, lack the Bayer color matrix used by conventional sensors, to a 35-mm sensor poses big challenges. Without a doubt, this is very good news, above all after finding out how good the 4th-generation Foveon sensor in a dp1 Quattro looks on paper. Yamaki is also conscious of the growing interest on the optical market for Sony’s Full Frame cameras with E-mount, so it’s perfectly possible that in the next few months we’ll see the arrival of new Sigma objectives for the A7 camera family. And, to conclude, another interesting point. When asked about the new objectives with automatic focus for Micro Four Thirds cameras, Yamaki affirmed that they would depend on the cost of designing specific lenses for these sensors. For the moment they prefer to use the same architecture for the ABS-C and Micro Four Thirds objectives because this allows them to put objectives on the market with the best quality-to-price ratio. Previous Is Sigma planning to launch lenses for Fujifilm’s X Series?